Exeter Marathon - FREE SPACES! The Exeter running event of the year, that you've all been waiting for is back in 2019 with a Bang! Pow! Boom! This time we'll be celebrating superheroes. Whether you want to run in memory of someone or honour someone special in your life, you can pick your own hero. Don't forget your fancy dress too! Will you dress as Wonder Woman, Batman, Superman or even make up your own superhero! Don't worry though, you can just be you if you like. We think you're all heroes! Now, the important part! Age UK Exeter is a local charity, delivering life changing services for older people and their families across the city. We don't receive any Government funding and are responsible for raising all the income needed to deliver our charitable services. Because of that we rely on your support so we are asking everyone to raise sponsorship for taking on this awesome challenge. If you don't want to raise sponsorship, maybe you could ask friends and family to make a small donation. For information on how to set up an online fundraising page or to make a donation please scroll down to to the Fundraising information. The Age UK Exeter 10K Superhero Run will START and FINISH on Exeter Quay. Runners will gather and warm up on Piazza Terracina before moving to the start line. 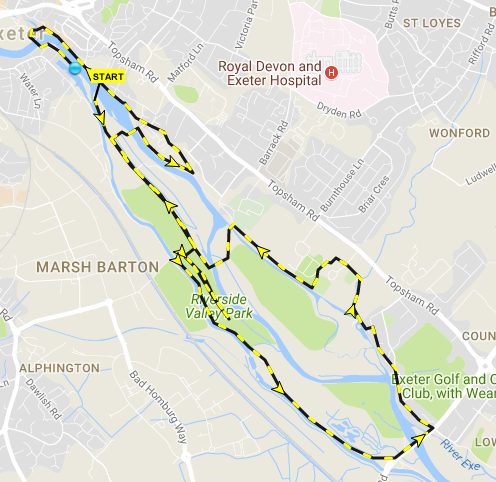 The run will take in Riverside Valley park, Double Locks pathway, Bridge Road, Mill Road and Mill Lane, Northbrook Golf Course and the beautiful woodland leading to Salmon Pool Lane Bridge, Duckes Marsh, Belle Isle Park and Exeter Quay. Click HERE for a fully interactive version of the route (we're so clever!). It really is a beautiful route. Every year Age UK Exeter helps and supports over 5,000 older people and their families in the city. We help people living with dementia, people who are lonely and isolated and people who have no one to turn to. While we appreciate it's not always easy to raise sponsorship, we hope you understand that the money raised at this event is essential if we are to continue to support our most vulnerable older people. The people we support could be your neighbour, your parent, your partner or even you. How to set up a fundraising page. Getting sponsorship for your fundraising activities has never been easier thanks to the likes of Facebook, Virgin Money Giving and Just Giving. These social media sites and websites let you set up your own fundraising page that you can direct your supporters to so they can easily sponsor you with just a few clicks of a mouse or a few taps of a screen. To help you set up an online fundraising page simply follow the instructions below or if you would prefer to download a sponsor form please click here. If you have a Facebook account and most of your friends do too then this is our preferred option as 100% of the money you raise will come to Age UK Exeter. The other sites take a small fee to process your donations. Click Fundraisers in the left hand menu of your News Feed. Select Age UK Exeter, choose a cover photo and fill in the fundraiser details. Select ‘Personal challenge’ and either choose a challenge from the options or select ‘other’ and enter details of your challenge in the box provided. Enter the location and date the challenge will be completed. Enter "Age UK Exeter" in the search box and click ‘search’. Select Age UK Exeter from the list of results. Enter the amount you intend to raise, specify that Age UK Exeter is not contributing to the cost and click ‘Next’. The next page specifies your unique web address for your fundraising page which you can share with your supporters. Simply click ‘next’ and then click on ‘Create my page’. Congratualtions! You have now created a fundraising page. On the next page click on 'Start Fundraising' and then under 'A charity' click on 'Start Fundraising'. Enter 'Age UK Exeter' in the search box and click ‘Search’. Select Age UK Exeter from the list of results. Select the type of event you doing. Fill in details of your event. Would your business like to sponsor this event? Thank you to the wonderful sponsors that supported us in 2018.